Your child will be off and running once these sneaker-inspired shoes are on their feet. 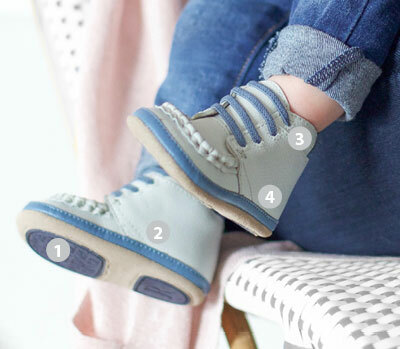 Taupe leather accents complete this contemporary and sporty baby shoe. I absolutely love these shoes for my daughter! I was looking for a pair of rubber soled shoes that adhere to the barefoor footwear qualifications and these are perfect! Flexible, lots of space in the toe box, absolutely no heel lift. I was a bit worried they'd be difficult to put on but they're extremely easy! I'm very happy with these and bought two other styles in larger sizes! They don't look like your typical cutesy baby shoes, which is what I love about them. They fit very well, and my son has room to grow into them. I adore these shoes. They’re cute and stylish and great for indoors, and most of all, they’re some of the only shoes that we could fit onto his chubby little feet! Robeez are now our go-to shoe brand. Excellent quality. My LO is 13mo and though the rest of the shoe fit well, these cut into his ankles. Too bad as these were very cute looking and well made. I had originally ordered a different pair of shoes for my son, however when I couldn't even get them on his feet I wrote a review and said I would be sending them back. The Robeez customer service reached out to me after my review and sent me a return label and asked if I would like to pick out another pair. 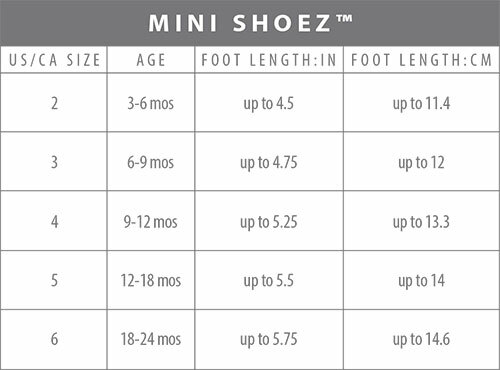 Since we loved the very first pair of Robeez we received as a gift I decided to try again and asked for these in a size larger. The shoes were shipped asap at no additional charge. They are a bit too big on him right now (I think the sizing on the returned shoes must have been off) but will fit perfectly in the spring and next summer. They are super cute, very easy to get on and they stay on. The shoes are awesome but it was really the customer service that made this a very good experience.